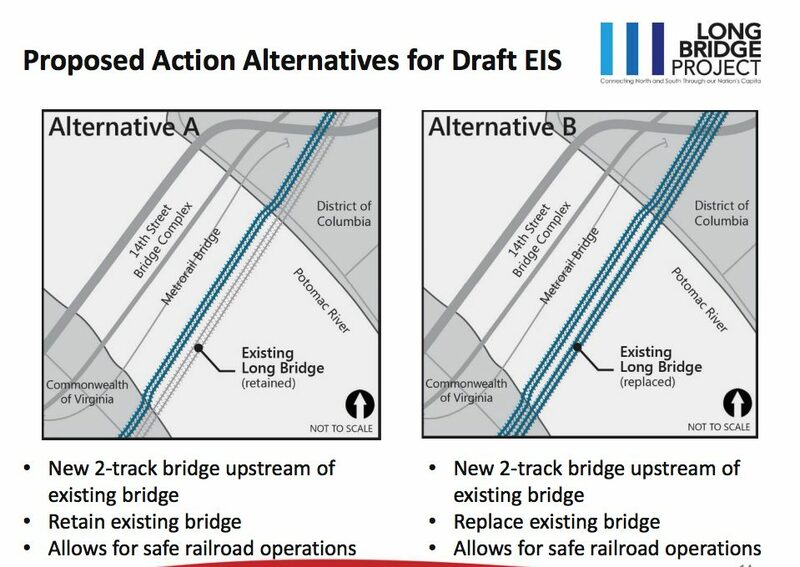 (Updated at 1:55 p.m.) Transportation planners have nearly finalized designs for a long-awaited effort to overhaul Virginia’s only railroad connection to D.C.
Officials from Virginia, D.C. and an alphabet soup’s worth of federal agencies have spent years working on plans to replace the Long Bridge — which runs roughly parallel to the 14th Street Bridge — and improve rail capacity over the Potomac River. Officials say they are almost ready to commit to more concrete plans to guide the redesign. The project still needs millions of dollars in funding to move ahead, and construction wouldn’t start until 2020 at the earliest, yet planners are pushing to have engineering and environmental analyses drawn up by summer 2019. State rail officials told the Northern Virginia Transportation Commission at a meeting last night (June 7) that they’ve managed to narrow down a long list of alternatives for replacing the bridge, which stretches from near the Pentagon in Arlington to Southwest D.C., to two final possibilities. Both plans involve building a new, two-track bridge alongside the existing structure, which was first built back in 1904. 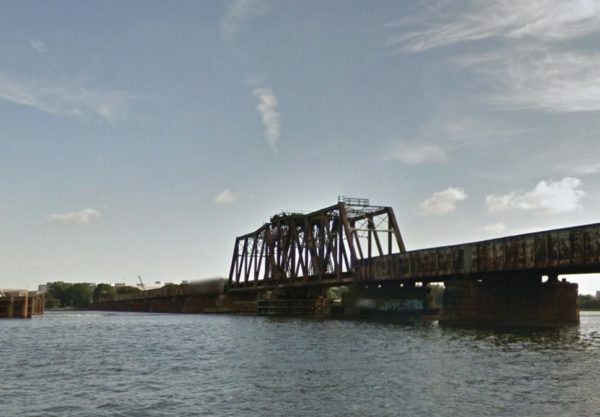 One alternative calls for the current bridge to stay in place; the other would involve fully replacing it. Either way, officials believe the project is critical for initiatives like ramping up Virginia Railway Express and Amtrak service between Virginia and the District. Doug Allen, the CEO of VRE, stressed that increasing rail capacity across the Potomac will be particularly critical for his trains. 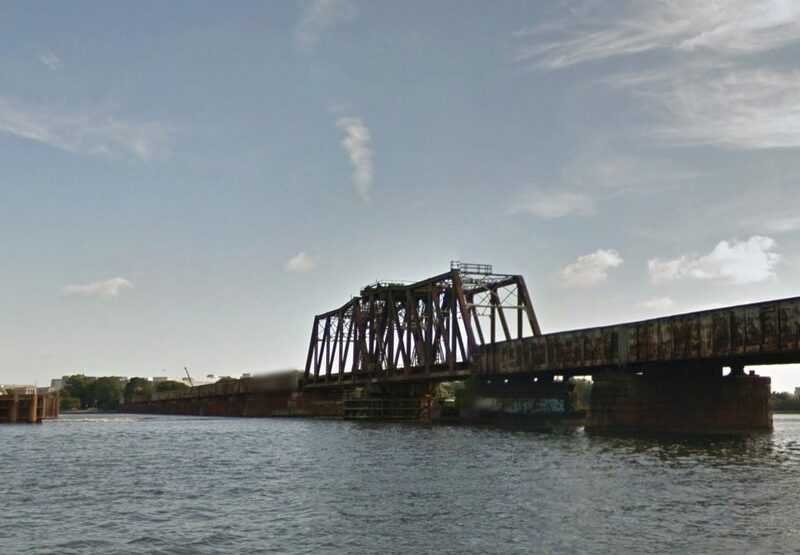 Commercial freight trains from the company CSX, which owns the bridge, often have to compete with commuter trains for space on the tracks, and Mitchell suggested that running a second bridge alongside the Long Bridge would help avoid that sort of conflict. “For us to be able to add more service to our trains, we need to add more tracks there,” Allen said. But even with so many people invested in seeing the project finished, Mitchell was sure to note that the whole effort is “very complex.” The bridge stretches just past historic resources like the Thomas Jefferson Memorial, not to mention other, “sensitive areas dealing with security” in D.C. itself, Allen said. 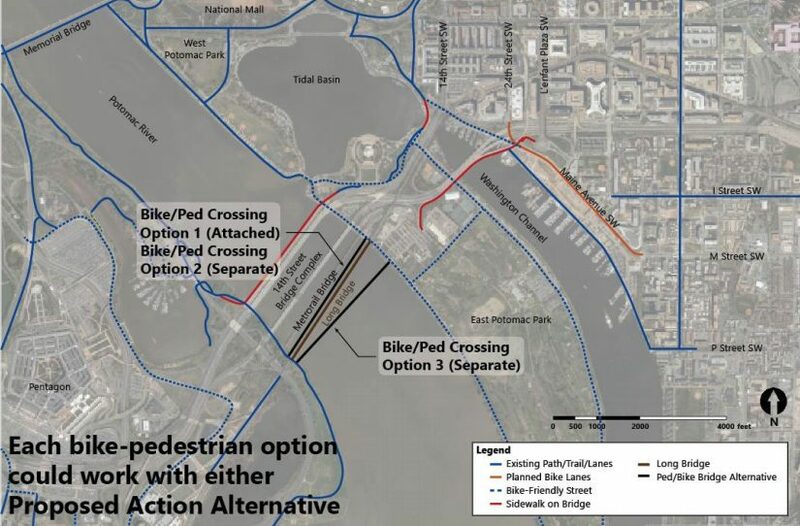 The project will also require extensive conversations about how exactly officials can include bike and pedestrian options alongside the new bridge, a key point of concern for Arlington’s representatives on the commission. Whichever option officials choose, Arlington County Board Chair Katie Cristol urged Allen to keep bicyclists, walkers and runners in mind throughout the planning process, given the unique opportunity this project presents. After all, she noted, the current crossing along the 14th Street Bridge does not offer a connection to the regional trail network on the D.C. side. Mitchell says officials hope to have more public meetings on the project this fall, with cost estimates, preliminary engineering plans and an environmental impact analysis all ready by next summer. Then, leaders will have to somehow find funding for the project. She says the state rail agency and CSX have committed to chip in a total of $30 million for the effort, and she fully plans to ask state lawmakers for more money by the General Assembly’s 2020 legislative sessions. “We are trying very, very hard to get this schedule completed on time,” Mitchell said. Photo via Google Maps. Graphics via the Long Bridge Project.